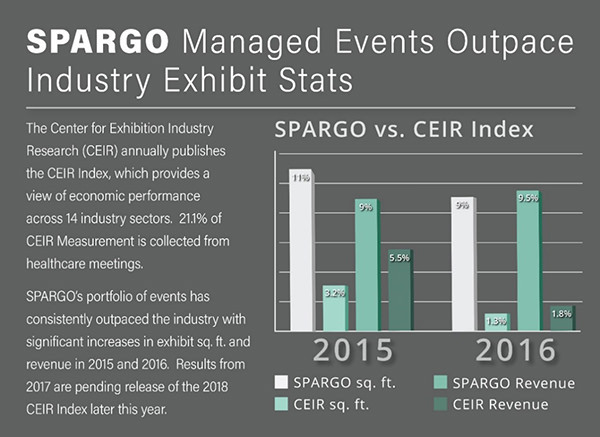 SPARGO, Inc., has again outpaced the CEIR Index. The Center for Exhibition Industry Research’s most recent report showed a modest growth of 1.3% in exhibit square footage and 1.8% in revenue across all 14 sectors it studied. SPARGO posted a 9% increase in square footage and 9.5% increase in total revenues. CEIR is projecting an average growth of 2.5% for expositions held in 2017 (the 2018 report will be published in late Spring 2018). SPARGO is projecting a 9% average growth increase for 2017 SPARGO managed expositions. SPARGO managed events include a variety of industries with meetings ranging between 200-42,000 attendees and net square footage of 7,300-256,000.